I'm always working to perfect gluten-free recipes. Gluten-free baking is hard. You often need a variety of flours to get that fluffy, gooey cookie that everyone loves. And finding that balance of flours (or perfect all-purpose flour) can be a process. Recently, I found a peanut butter cookie recipe on Pinterest and decided to make it gluten-free. Acknowledging my most recent baking ventures have been some big fails, I wasn't expecting much. But this recipe turned out so well that I had to share it with you. Looking for dairy-free? 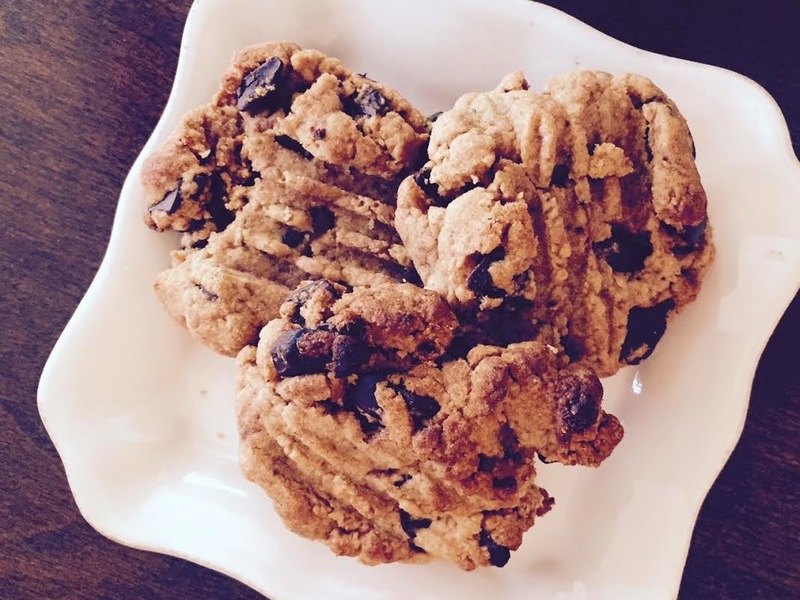 Simply use dairy-free chocolate chips. Cream together peanut butter, butter, white & brown sugar until blended. Beat in egg, almond milk, and vanilla. Combine flour, baking powder, and salt in separate bowl. Add flour mixture to peanut butter mixture and mix. Scoop tablespoons of dough and roll into balls. Place cookies 2 inches apart on baking sheet. Press each ball with fork.